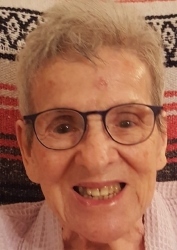 Hilda M. Maestri passed away on Thursday, April 4, 2019, at the age of 97. Beloved sister of the late Robert Maestri (Gladys), Marion Maestri, Mildred Bertram (Jerry) and Lloyd Maestri. Loving aunt of Cheryl Bertram and Jan Bell (Patrick). Daughter of the late Ralph Maestri and Theresa Groppi Maestri. She is also survived by many extended family members and caregivers. Miss Maestri was a retiree of the Federal Government. She graduated from St. Joseph Academy. Hilda was a member of the AARP Senior Social Group, Elenian Club, St. Mary’s Italian Club and the Bingo Club of St. Anthony of Padua. Relatives and friends are invited to attend the visitation at Greenwood Funeral Home, 5200 Canal Blvd., New Orleans, on Wednesday, April 10, 2019, starting at 12:00 PM, followed by a Memorial Mass in the Chapel at 1:00 PM. A private inurnment will follow in St. Louis Cemetery #3.